It’s a beautiful tale of graciousness and sacrifice. Hopeless, drug-addled mice, suddenly stricken with diabetes, are offered a cure at the mercy of their all-knowing scientist overlords. Their rat-tailed comrades miraculously grew functioning mouse pancreases and the higher power, blessed be, healed the mice with the bounty. Amen! Or at least, that’s how a bunch of lab mice probably felt when a team of Japanese scientists grew functioning mouse pancreases in rats and used the them to cure the mice’s artificially-induced diabetes. But the research is more than a see-what-we-can-do experiment. The scientists hope to one day grow human organs in other animals in the same way. There are tens of thousands of people waiting for organs, but they can’t just waltz into a hospital and say yes, I’ll take one kidney à la carte. The team previously grew rat pancreases in mice back in 2010, but the little organs weren’t big enough to work in rats. Their latest experiment does the opposite. The scientists began by injecting mouse pluripotent stem cells—blank slate cells that can develop into the other types of cells—into rat embryos. The embryos developed into chimeras, rats containing a mixture of mouse and rat cells. 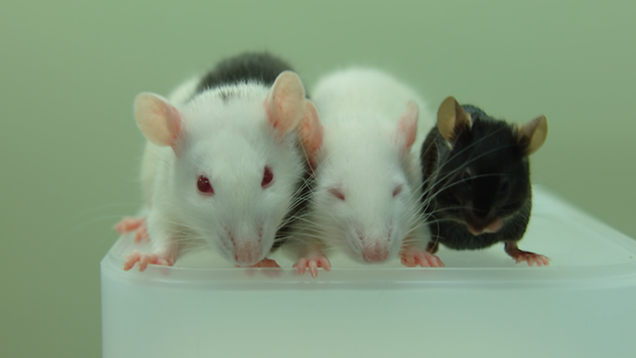 But the scientists deliberately suppressed the rat gene in charge of pancreas development, so the cuddly chimeras grew mostly mouse cell-only pancreases. After receiving a part of the pancreas called the endocrine islet, the team’s several drug-induced diabetic mice only required immunosuppressive drugs for five days, which seemed to allow their immune systems to get rid of any lingering rat cells. The transplanted islets functioned for a year, according to the study published today in Nature. These results are exciting, but it’s ultimately a proof of concept if you look at what scientists hope to accomplish in the long term. “Their study is well executed and we’re happy to see the result,” Jun Wu, a research associate at the Salk Institute for Biological Studies in California who was not involved in the study, told Gizmodo. “But that’s rats and mice. To move to humans you have to take another step forward.” Rats and mice are much closer on an evolutionary scale than say, rats and people, or people and sheep, though scientists are working on growing human cells inside pigs as we speak. “Major technical challenges probably lie ahead,” writes Qiao Zhou, an associate professor at Harvard who reviewed the paper for Nature, “including poor contribution of human cells to animal embryos and rejection of human organs by the host animal’s immune system.” He also pointed out that even in the mouse-rat model, organs like hearts and kidneys are more complex, and would therefore be more difficult to grow. With all the discussion about transitioning this research to humans, though, the researchers seem to be leaving one major question unanswered. How did they get the chimera rats and mice to sit still long enough to pose for these pictures?